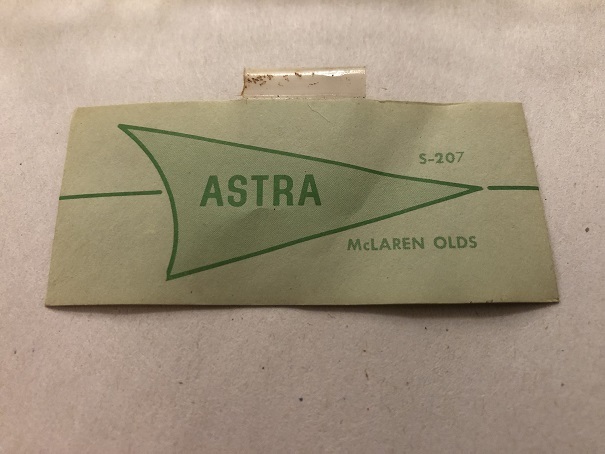 Astra clear bodies - any history? 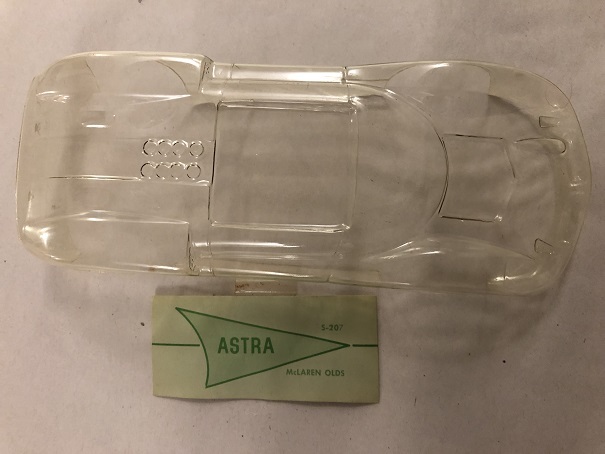 Astra clear bodies, any history ? Uncovered going thru old boxes. Philiippe - hold the presses, a new company to put in the book! No Gene, have never heard of this one... think it was a local producer? I have no idea, the body ID card was taped inside of the body. Pretty good looking body with very good detail for the era. Looks like great detail, as good as a Lancer from the pics, reminds me of the SI Select brand. Had not seen Astra brand before this. There were actually two different prototype cars, the M1 and the M1A, that this body could be representing. The M1 was the "works" car. McLaren built three during 1964 and began racing them in September of that year. The M1A was the "customer" car built under license by Elva in 1965. There were something like 24 of them. These cars were sometimes called "McLaren Elvas" or "Elva McLarens", but they were actually the model M1A. The three M1s and the twenty-four M1As were all equipped with Oldsmobile V8 engines, so the name "McLaren Olds" is, while not incorrect, less than fully adequate to pin down exactly which car this body is supposed to represent. 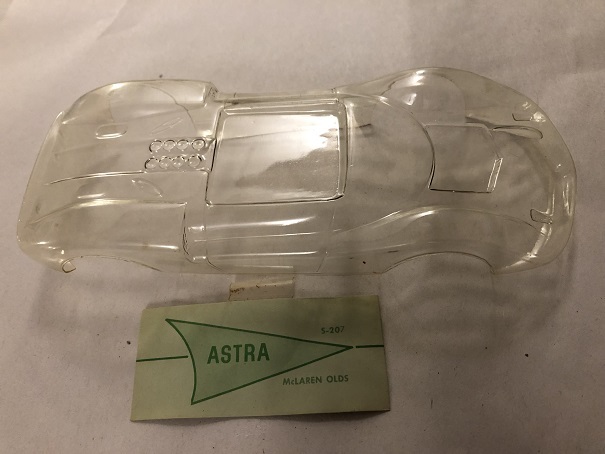 Given the time it took to carve and produce a high quality mold, if this is an M1, then this Astra product probably dates to 1965. If an M1A, it could be as late as 1966. Either way it is in remarkably good condition for being more than 50 years old. Tomorrow I will take more photos and post measurements. I did give it a warm soaking and ivory soap cleaning in prep for a set of silicone molds. It will most likely be a 2 piece mold.